"An artists construction on the threshing floor around 1000 BCE through 70 AD"
This would have been the rock where Abraham took Isaac on the mount to sacrifice him to the Lord, but the Lord had stopped him at the last moment. "After these things God tested Abraham, and said to him, "Abraham!" And he said, "Here am I." He said, "Take your son, your only son Isaac, whom you love, and go to the land of Moriah, and offer him there as a burnt offering upon one of the mountains of which I shall tell you." I awoke this morning with a picture in my mind of this, flat topped, outcropping of rock (threshing floor) that King David purchased and how it might have progressed in stages through time until it became what we see today. I also had a desire to try and draw what I was seeing. 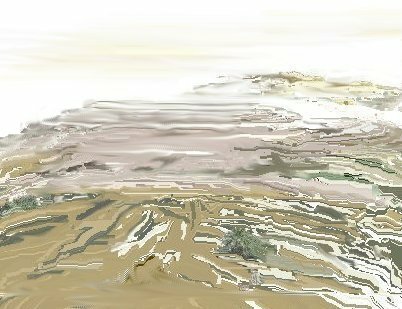 Below are some simple computer generated paintings I created in a paint program. 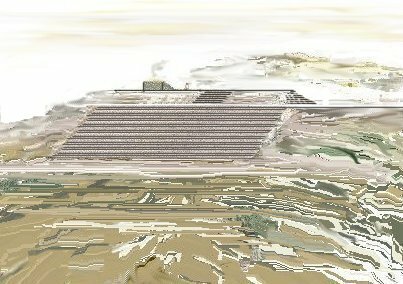 The first one being of what Ophel Rock (sakrah/sela), or the threshing floor, would have looked like as viewed by King David from the City of David. And God came that day to David and said to him, "Go up, erect an altar to the Lord on the threshing floor of Araunah the Jebusite." . . . And David built there an altar unto the Lord, and offered burnt offerings and peace offerings. So the Lord heeded the prayers for the land, and the plague was withdrawn from Israel. David then erected an altar there and offered sacrifices there. I believe this rock was the threshing floor (pavement). Later Solomon built the House of the Lord there as planed by King David. The steps were cut into the bedrock and then smooth flagstone was laid over the top and an altar was placed at the top, as seen below. It was not for David to build the Temple but for his son, Solomon, to build it. To do so in this particular place a platform with banks had to be built towards the west of the threshing floor (altar platform). The building of the First Temple was a monumental task. Phoenician craftsmen were employed to build the Temple. Construction began in the fourth year of Solomon's reign and took seven years. Then King Solomon raised up a labor force out of all Israel - and the labor force was thirty thousand men . . . Solomon selected seventy thousand men to bear burdens, eighty thousand to quarry stone in the mountains, and three thousand six hundred to oversee them. It is written in the Jewish Mishna that the temple itself had to be built over vaults. The vaults were important because the air had to be between the earth (grave) and the temple, because the temple must be pure. The temple was not built on the bedrock platform... but next to it. The bedrock was the place of the altar and the altar was before (in front of) the temple. A vaulted platform (banks) were built, joining it with the threshing floor, on which the temple of Solomon was then built. This extended the 215 ft platform to include a Temple platform. After this, Solomon built a cloister on the east and then began building walls and filling the area with vaults and dirt to create a level area, although still terraced. This long platform leading to the temple became known as Upper Street. It was the way to the Holy of Holies. With this theory it helped me understand why Josephus describes so many stets of steps. After the completion of the Temple it was dedicated by King Solomon in 953 BC. When Solomon had ended his prayer, fire came down from heaven and consumed the burnt offering and the sacrifices, and the glory of the LORD filled the temple. And the priests could not enter the house of the LORD, because the glory of the LORD filled the LORD's house. When all the children of Israel saw the fire come down and the glory of the LORD upon the temple, they bowed down with their faces to the earth on the pavement, and worshiped and gave thanks to the LORD, saying, "For he is good, for his steadfast love endures for ever." Then the king and all the people offered sacrifice before the LORD. King Solomon offered as a sacrifice twenty-two thousand oxen and a hundred and twenty thousand sheep. So the king and all the people dedicated the house of God. The priests stood at their posts, the Levites also, with the instruments for music to the LORD which King David had made for giving thanks to the LORD for his steadfast love endures for ever whenever David offered praises by their ministry, opposite them the priests sounded trumpets; and all Israel stood. Solomon marked out the bounries of a square area that encompassed the Temple. The soreg was a low wall surrounding the Holy Temple, which served as a boundary. Beyond this point, entry was permitted only to Jews who were not impure through exposure to death. The Temple, inner courts and woman's court were all within the soreg. At a later time King Manasseh (698-642) compassed the Ophel hill with the outer wall, making it into a compound or fortress. (But I am still referring to it as Solomon's wall) They dug down to the bedrock and cut a level place for each foundation stone, building up the walls. Then fill was used to create a level area. 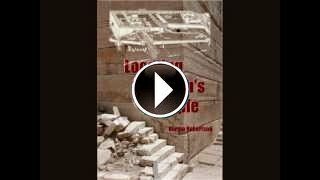 Herod The Great tore down and then built a new Temple and Inner wall. He also extended the Temple and priests platform, and women's court, to the north to make room for his larger Temple. 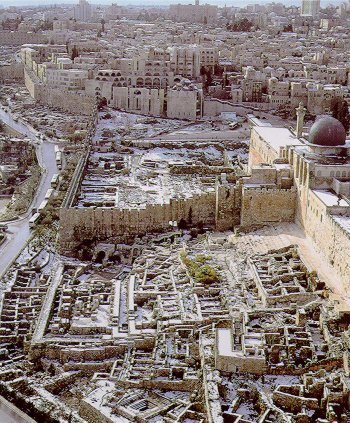 Later the descendents of Herod increased the size of the outer courts to the North, West, and South (which were destroyed just a few years after they were completed). The Inner wall was 60 feet on the outside but only 37.5 feet on the inside. The reason for this is because the walls of the 22 feet high platform were included in the height when viewed from the outside. It encompassed not only the Temple building but also the Altar platform (threshing floor) and the cloister (Gate) that he built on the east. 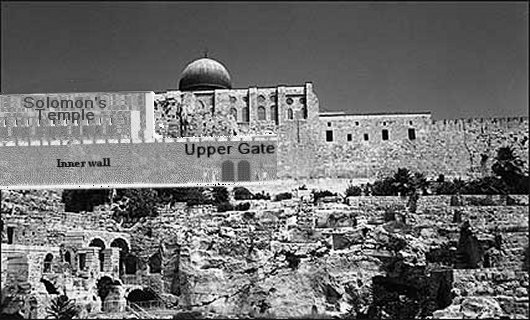 Josephus speaks of going up many different sets of steps to reach the inner gates! This is a view of the Ophel ruins from the side (picture taken from the mount of Olives) Notice that the ruins are on a terraced hill. The city wall leading up hill, from right to left, was built after the Temple was destroyed in 70 AD. It cuts the Ophel ruins in half, the rest of the ruins that were part of the Temple compound are behind that city wall. the highest point, where a tower was built (later becoming fort Antonio) by which the temple was defended from Northern attacks.